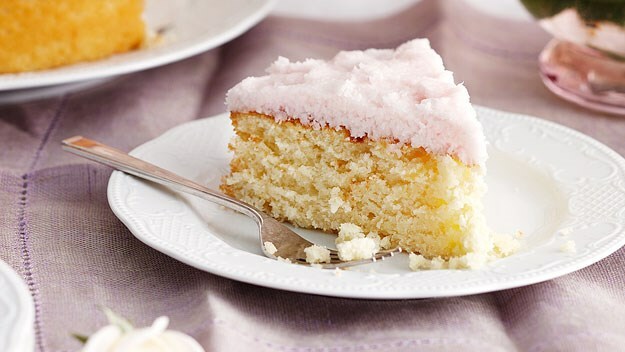 The star of this luscious recipe from women’s weekly is definitely the coconut ice frosting. This is a really simple recipe with spectacularly delicious results, perfect as a centre piece for any high tea. Preheat oven to 180˚C. Grease deep 23cm square cake pan; line with baking paper. Beat butter, essence and sugar in bowl with electric mixer until light and fluffy. Beat in eggs, one at a time. Stir in coconut, sifted flour, sour cream and milk, in two batches. Spread mixture into pan; bake about 40 minutes. Stand cake 5 minutes; turn, top-side up, onto wire rack to cool. Meanwhile, make coconut ice frosting. Drop alternate spoonfuls of white and pink frosting onto cake; marble over top of cake. Coconut ice frosting: Sift icing sugar into medium bowl; stir in coconut and egg white. Place half the mixture in small bowl, tint with pink food colouring. This cake can be stored in an airtight container for up to 1 week.